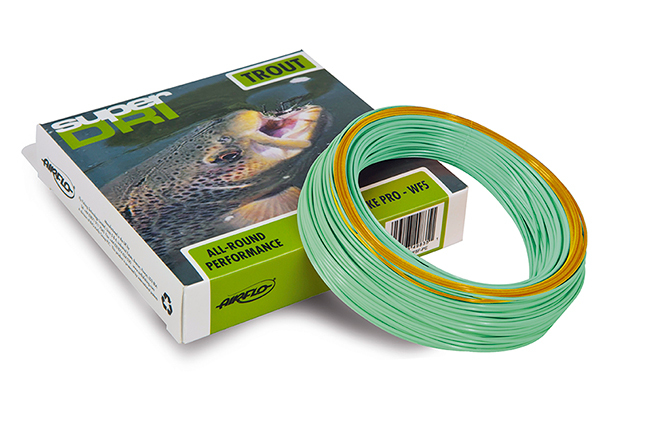 Airflo Super- Dri Lake Pro Fly lines feature Airlfo’s patented SuperDri technology which has been developed for the serious floating line angler, featuring a friction reducing coating which lets the line glide through the rod rod rings and adds yards to your cast. The Airflo SuperDri's coating gives you unparalleled floatation with the ability to repel water, dirt and surface scum better than any material in the history of fly lines. Another new feature of the SuperDri range from Airflo is 'Zone Technology', a new concept that uses a low compression compound in the part of the line exposed to the most stress, ensuring the line doesn't stick to the rod guides when hauling and shooting. This new line technology will minimize friction during the cast, helping with distance and extending the life of your floating line. Coupled with Airflo's revolutionary ridge and power core, you will notice the difference from your very first cast. Airflo's Super-Dri Lake Pro has been specifically designed for the Stillwater angler, this line utilizes the popular DELTA taper profile for easy distance even when casting multiple flies. The InTouch Midge Tip Long line features a unique, 6 ft (2m) long, clear camo intermediate tip for fishing in the top layers of the water column.